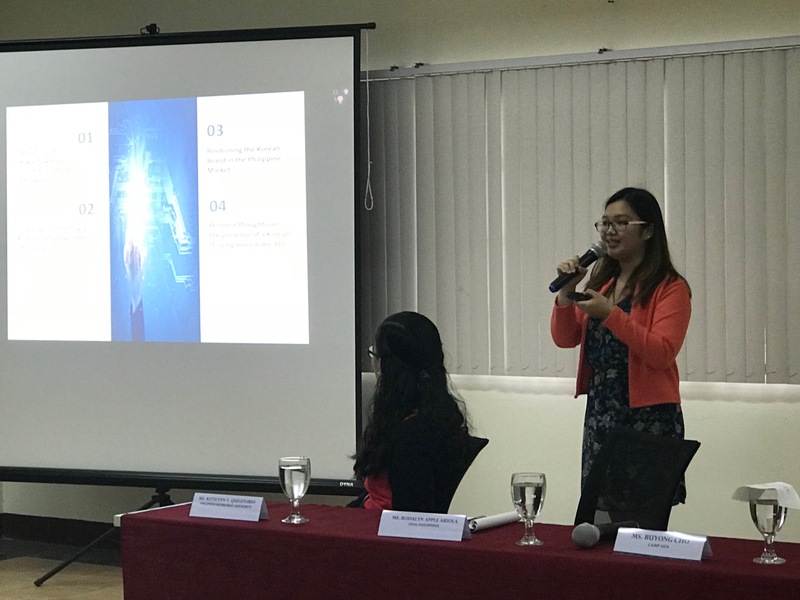 In a small forum sponsored by the University of the Philippines Korea Research Center (UP KRC) on 15 June 2018, Rodalyn Apple Ariola, UP CIFAL Philippines’ newest project assistant on Migration and Gender Equality, articulated her experience in working with a Korean company in the Philippines. In her presentation, Ariola highlighted the success factors of the South Korean company operating in the Philippines such as adapting the Korean product to the local Filipino taste and pointed out as well the challenges in the Philippine business environment confronted by Korean companies such as dealing with permits to operate new technology. CIFAL Philippines, through Ariola, embarks on a micro study of the benefits and opportunities as well as the challenges of inward flow of migrants in the Philippines, focusing on Koreans, who according to data from the Department of Tourism have been the top foreign visitors since 2006. The research on inward flow of migrants balances the outward Filipino migrants whose narratives are usually highlighted by controversial issues and provides a better understanding of the impact of migration to both the sending and the receiving countries. The UP Korea Research Center forum was an occasion for Filipino researchers to present studies on migration, marriage migrants, Korean consumerism, business, language and literature. It also featured Korean development projects, Philippine Retirement Authorities’ policies and programs for foreign retirees, a big number of whom are Koreans. The keynote speaker was Dr. Tae Gyun Park from the Graduate School of International Studies, Seoul National University.